Rapid renewable energy adoption by homeowners and grid visionaries resulting in the mothballing of dirty and dangerous power sources. It’s the kind of action that’s absolutely necessary if we’re going to have a prayer in dealing with human-caused climate change. And South Australia is making impressive strides by doing just that. Despite being afflicted with a backwards Federal Government that is radically opposed to the further expansion of renewable energy, Australia continued to make amazing gains in alternative energy adoption this year. Throughout the country, rooftop solar installations surged — spurred on by a combination of high electricity costs, plummeting panel prices, and a grid readily capable of handling renewable energy additions. Both the upgraded grid and the incentives for home renewable energy use that started this trend can be attributed to earlier and wiser governments. And, as a result, Australia boasts a massive distributed solar capacity with one out of every five homes (19 percent) across the country featuring solar arrays. In South Australia, the story is amplified. This region of Australia features the highest home owner adoption of solar energy in the country — with more than 23 percent of homes equipped to generate solar based electricity. In addition, the grid in South Australia is heavily supported by 1,500 megawatts of wind turbine generated power. 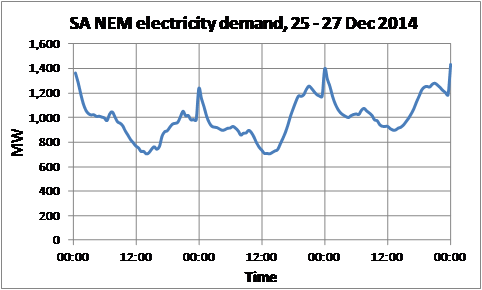 As the wind tends to peak at night and solar peaks at mid-day, South Australian grid operators show few strong peaks in demand. And this makes grid operation quite a bit easier and less taxing on personnel and equipment. 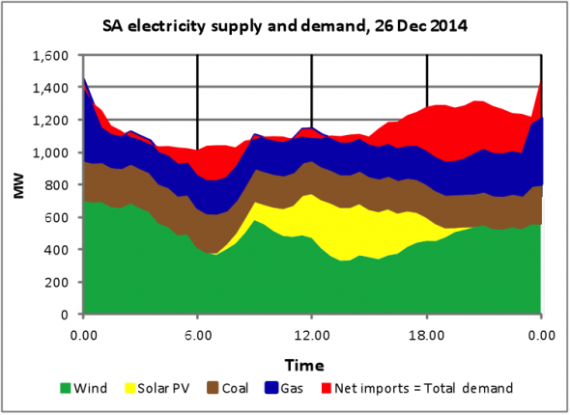 The typical mid-day peak is smoothed out by solar even as wind powers up through the night. The only peak in the system occurs at midnight — when water heaters are programmed to switch on and take advantage of supposedly cheapest times. However, ramping solar energy adoption has tipped this previously intelligent feature on its ear as cheapest times now come at noon with the surge in solar wattage. On this day, solar energy’s contribution to grid generation surged to 30 percent even as wind dropped off in the heat of the day. Perhaps more impressive was the fact that fully 52 percent of this region’s electricity was generated by renewables — with the lesser portion being derived from coal, gas and imports. South Australia’s 1500 MW worth of wind and high solar rooftop penetration resulted in an average of 40 percent of electricity coming from renewables in 2014. A figure that is expected to surge above 50 percent well before 2025. An upshot of this is that two coal fired plants have been mothballed. These plants will no longer crank out tons and tons of greenhouse gasses. They have been idled, set to pasture by far less harmful energy sources. Meanwhile, Rob Stobbe, CEO of SA Power Networks notes that he sees no future for large conventional fossil fuel generators. Stobbe’s vision is instead for rooftop solar, storage and renewable-based micro grids served by an operator and integrator like SA Power Networks.